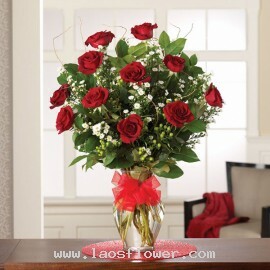 Send him or her 11 roses when you want to ensure that your lover will love you. Flowers & gifts delivery service in Vientiane, Luang Prabang, Pakse, and Savannakhet by Laos Florist. 11 roses, when you want to make sure that she has a true passion and love. 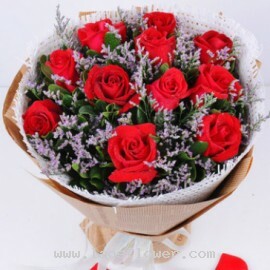 Send a bouquet of 11 red roses to your beloved. 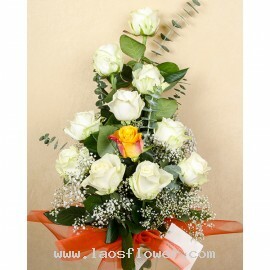 11 roses bouquet consists of 8 pink roses arranged around 3 red roses in the center accent with white gypsophila. Wrapped in cream paper and pink mesh. * The color of roses and materials used can be changed. Occasionally, substitutions may be necessary to create your bouquet due to the availabili..
11 pink roses arrange to show one-side accent with leaves and white gypsophila. Wrapped in brown material. This bouquet is suitable for use as a birthday gift. Perfect for 11 year old birthday. Or send to boyfriend or girlfriend or on the day of graduation. Occasionally, substitutions may be nece..
A bouquet of 11 red roses accent with purple caspia flowers and wrapped in white mesh and brown paper outer layer. Adorned with a white bow tie. The color of the flowers and materials used can be changed. Occasionally, substitutions may be necessary to create your bouquet due to the availability ..
A bouquet of 11 red roses arrange as pyramid shape accent with leaves and vines. Wrapped with red paper and red bow. The color of roses and paper can be changed. Occasionally, substitutions may be necessary to create your bouquet due to the availability of certain flowers in various parts of the ..
11 red roses arranged in a clear glass vase accents with mickey mouse, white flowers, and vines. Finally, tie the knot with red ribbon. The color of roses and materials can be changed. Occasionally, substitutions may be necessary to create your bouquet due to the availability of certain flowers i..
11 roses bouquet consists of 10 white roses and 1 yellow rose in the middle accent with gypsophila at the base of the bouquet and eucalyptus. Wrapping with orange paper and yellow bow tie. Occasionally, substitutions may be necessary to create your bouquet due to the availability of certain flowe..
A bouquet of 11 white roses arrange in a pyramid shape open to show only one side. Accent with eucalyptus leaves, ferns and other foliage. Wrapped with purple and tied with a white and purple ribbon. The flowers and wrapped all that can be changed. 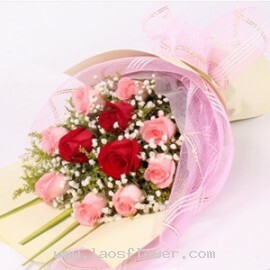 Occasionally, substitutions may be necessary to ..
A bouquet of 11 pink roses accent with freesia. Wrapped in pink paper and tied with pink ribbon. 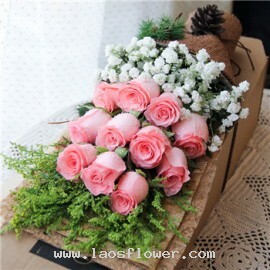 The color of roses and materials in the bouquet can be changed as you like. Occasionally, substitutions may be necessary to create your bouquet due to the availability of certain flowers in various pa..
A bouquet of 11 red roses arrange in round shape accent with white gypsophila. Wrapped in brown paper and tied with a dark brown & white bow. You can design your own to change the colors of roses and paper. 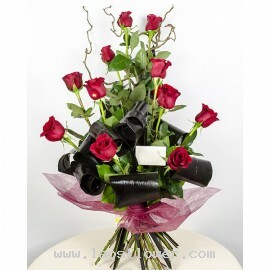 Occasionally, substitutions may be necessary to create your bouquet due to the availab..